Bamboo is grown for its striking architectural stems and foliage. These plants are members of the grass family and most have a very upright habit. They look wonderful in modern gardens as well as adding a jungle like feel to tropical schemes. However, they don’t look out of place in a more traditional garden where they can provide height and structure and a backdrop to colourful perennials. They are wonderful screening plants and can be used to hide fences and unsightly structures, as well as dividing the garden. But they can also be used as a specimen plant grown in a bed or a stylish pot. There are a wide range of bamboo plants available, from small shrubby types to creeping varieties to giant trees so choose carefully. Read on to find out how to choose and care for these wonderful plants. Bamboo is in the subfamily Bambusoideae of the grass family Poaceae. Some very hardy bamboo can survive temperatures as low as -20. Most will be fine at temperatures down to -5. There are many varieties of bamboo and they can have very different growth patterns and habits. Some species can be invasive, and these are best kept in containers or in bottomless buckets in the soil keeping the lip of the bucket just above the soil to prevent the roots from spreading. However, most varieties are well behaved and will keep to their appointed position. As the varieties differ so greatly it is especially important to choose a plant that is suitable for the space you have. This clump forming bamboo produces dense clusters of canes. It makes an ideal choice as a specimen plant. It has canes of olive green that mature to yellow brown and grows to a height of 4 metres (13 feet). It will enjoy a situation in sun or part shade. This popular species is another clump forming variety that will not invade the rest of your garden. It will reach a maximum height of 4 metres (13 feet). This another well behaved species that spreads slowly and grows to the same height as Fargesia murieliae. The canes mature to an attractive dark purple. It enjoys a position in light shade with cool, moist soil. The same height as the previous two species, this has very dense foliage, making it ideal for screening. 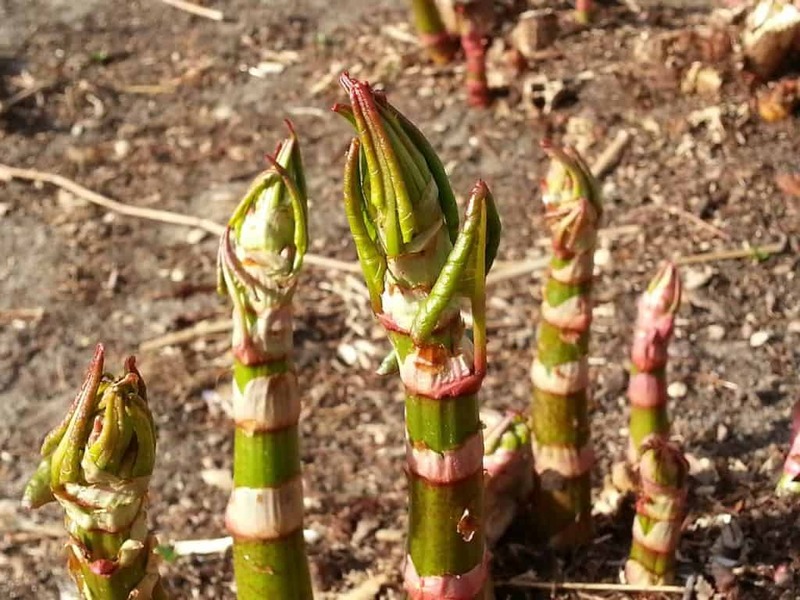 In a sunny site, the stems will turn yellow. This species will do well even in dry soils. This species is commonly known as black bamboo. It can reach a height of 4 metres (13 feet) but will often stay a little smaller, depending on the room it has. The canes turn jet black by the third year and even more quickly if it is situated in a dry, sunny site. This bamboo is suitable for growing in containers. This variety spreads slowly and is easy to control. The stems are purple-green, and the leaves are yellow striped with green. It will reach 1.2 metres (4 feet) in height. It will have the best colour if grown in full sun. To keep the colourful new++ stems you can cut it back to the ground in spring. This small variety reaches only 90 cm (3 feet) in height so is perfect for the smaller garden or for growing in a container. It is a colourful variegated specimen with creamy white leaves. It prefers sun or dappled shade otherwise it tends to lose the variegation. This is a clump forming variety that reaches an ultimate height of 3.5 metres (11 feet). It features slim, olive green canes and large, glossy leaves. It can tolerate wet conditions better than most varieties. Bamboos are hardy and pest and disease resistant. Given a reasonable amount of care they should provide you with an abundance of growth year after year. Many bamboo varieties are equally happy in sun or part shade. However, do check the particular variety you choose for what suits them best. You should water bamboo regularly when they are young. This will help them grow quickly and prevent you from losing the plant. Do not flood them with water daily, though as this can encourage roots to rot. Ideally, water them thoroughly, but without flooding them, just as the soil begins to dry out. Once established they will need watering less often but keep an eye on then during prolonged dry periods. Container grown plants will, or course, need regular watering. Usually, a soaking three times a week will be enough, however, if the pot is small or the container in a warm, sunny position you may need to water it up to five times a week. Your bamboo will thrive in most soils as long as it is not extremely dry or very waterlogged. Pseudosasa japonica can cope with wetter soil than most varieties and Phyllostachys nigra and Phyllostachys aurea will suit a drier soil. If planting in a container, use a soil based compost as this will keep its structure for longer than a potting compost. 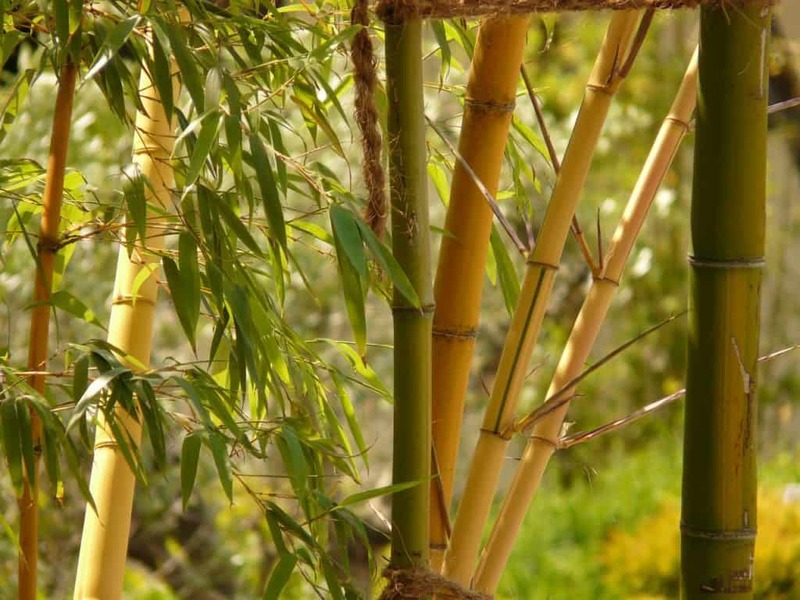 Established bamboo plants should be fed with a slow release granular feed every spring. They will also benefit from a 5-7.5cm (2-3in) deep mulch. This will help them to retain moisture and keep the roots cool, as well as supressing weeds. In addition, if your plant seems to be lacking in nutrients you can add a high nitrogen fertiliser such as a lawn food in early spring and again in early summer. Young plants should be fertilized more often until they are established. In the UK it is advisable to plant bamboo in the late spring when all risk of frost has passed. This gives them a chance to get well established before winter. Dig a hole that is twice the size of the rootball of your plant. Loosen the soil at the bottom of the hole and mix in some garden compost or well-rotted manure. If you are planting bamboo as a screen it can be easier to dig a trench rather than individual holes. This will also allow the roots to spread more quickly. Place the plant in the hole or trench so that the top of the root mass is level with the soil. Backfill and water thoroughly to settle the soil around the roots. To create a bamboo screen, it is best to plant them around 3- 5 feet apart. Growing bamboo in containers will naturally restrict their size. You should choose a pot larger than the rootball to accommodate plenty of compost. Wooden containers work well as they provide some insulation from cold weather. Make sure the pot has plenty of drainage holes, so the bamboo roots are not sitting in wet soil for long periods as this will cause them to rot. To keep your bamboo healthy, apply a thick mulch in autumn. This will help protect the roots through winter. You can use well-rotted manure, bark, garden compost or leaves. If your bamboo is planted in a pot, move it to a position that is sheltered from the worst winds and wrap the pot in fleece or bubble wrap. Container grown bamboo usually require repotting every two to five years depending on the variety. When the roots fill the container, it is time to give them a new home. Bamboo looks in good in a variety of situations. It can be used as screening, working well in modern city and courtyard gardens where they can be used to hide unsightly structures or views. They also look wonderful grown as a specimen tree planted either in the ground or in a stylish pot. They also make a nice backdrop to a tropical garden or to more tradition cottage style schemes helping more colourful plants to be seen at their best. The new canes of bamboo get taller and thicker each year up until they reach maturity, usually around 10 years. Once they are mature, it is worth cutting out the oldest canes as well as any weak ones. This will allow space for new canes as well as allowing air circulation through the plant. You should also prune out any canes that have flowered, though this is a rare occurrence. 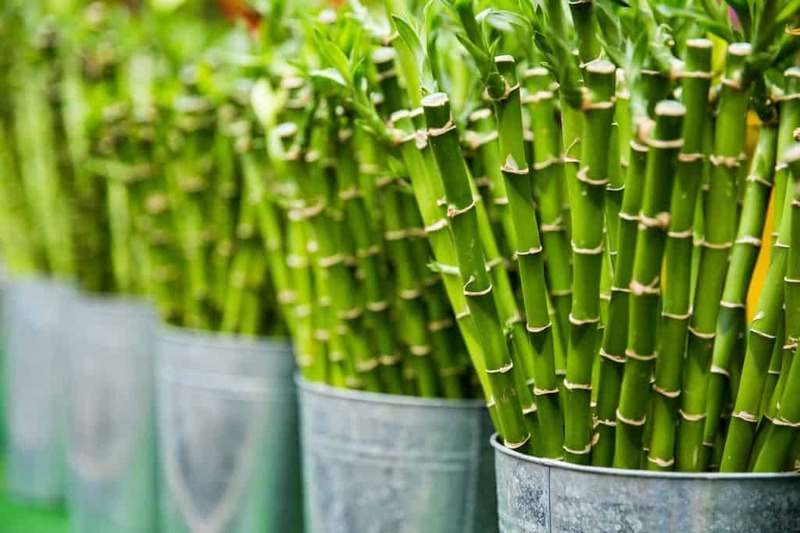 In general, you can prune your bamboo in whatever way is required to keep it looking good and maintain the size you want. Simply cut off any old, dead or unattractive branches. Make each cut just above a leaf node so that you do not leave a bit of stem that will die back and look unsightly. You can also thin out clumping bamboos to retain an airy appearance and allow air to circulate through the plant. Groundcover bamboos can be cut back hard at the end of winter if they are becoming straggly. This will promote fresh, new growth. This method is suitable for most bamboos and is especially good for clumping forms. You can divide plants once they are around two years old. Dividing large, tall bamboos is hard work. The stems and root masses can be very heavy so be sure to use proper lifting techniques. Dig up a clump of bamboo and you will see a mass of rhizomes and roots. Pour over some water which will loosen the dirt and enable you to clearly see how best to divide the clump. Divide the clump by pulling it apart or by cutting through it with a spade if necessary. Replant the clumps in a new area or a container, firm in and water well. You should water the new plant regularly as well as the parent clump until it has recovered. This technique is particularly good for creeping, ground cover types of bamboo. It will take a little longer to establish a new plant with this method than with divisions. Locate a large healthy rhizome with plenty of feeder roots. Remove this rhizome from the parent plant with a clean, sharp knife. Keep the soil in the pots moist but not waterlogged. Overwatering will cause the rhizome to rot. Bamboo are strong healthy plants and with reasonable care, they should remain free from pests and diseases. However, it is worth keeping an eye out for the following diseases just in case they occur. This virus is usually spread in nurseries where it is transmitted by infected pruning tools. You may notice a mosaic discolouration on the leaves and the die back of the top of the plant. There is no cure for this disease, though you may be able to slow its progression with hard pruning. Always but new plants from a reputable nursery to avoid this problem. Occasionally, bamboo may succumb to fungal diseases of the leaves or the roots. In order to prevent these, good water management is key. Do not let your bamboo sit in waterlogged soil and this will prevent root problems. Watering your bamboo at the roots rather than all over the stems and leaves will help to prevent fungal diseases. Regular pruning will make sure there is plenty of air circulation through the plant which will also lower the risk of fungal diseases getting a hold. Q I have inherited a large and very invasive bamboo that is taking over my garden. How can I get rid of it? Although you can get rid of bamboo by digging it out, this is heavy work and it can be difficult to remove all the rhizomes. This is probably a case were a weed killer is the only practical solution. Cut down the canes in late winter and the apply a glyphosate-based weed killer to the new growth in spring. Repeat the application in early summer. You may need to repeat the treatment again to any growth that remains. Q The leaves of my bamboo are going yellow. What could be wrong? Bamboos are evergreen plants; however, they do lose their leaves, just not all at once like deciduous plants. So, some yellowing and dropping of leaves is normal. However, if many of the leaves are turning yellow this indicates a problem. The most likely reason is lack of nutrients. This can happen in poor soil and can also be a symptom of overwatering which washes nutrients away. I would recommend applying a high nitrogen fertiliser to you plant to se if that greens up the leaves. Also, avoid watering the plants until the soil is just drying out.